I just finished this tunic. I tried to get a good photo of the tunic without the dog in the way, but he insisted on being in the picture with me. 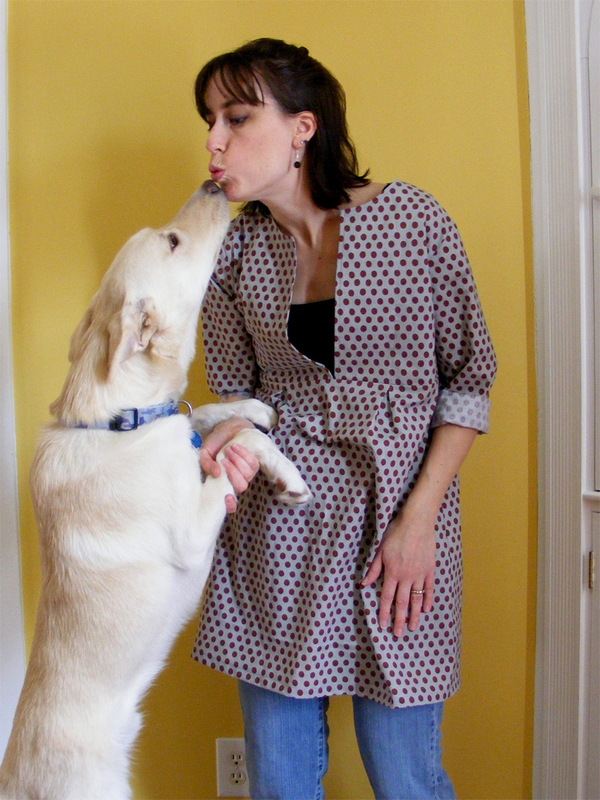 The pattern is the Schoolhouse Tunic by Sew Liberated, and it was a dream to sew up! It only took about an hour to sew, all the pieces fit together with no adjustments, the finished piece is exactly the size the pattern envelope said it would be and the instructions were clearly written and easy to understand. I would definitely recommend this pattern, no matter what your skill level. The tunic fits beautifully and is very, very comfortable. The tunic comes in 2 different lengths and you can sew the cuffs with elastic or without. I chose without. I made the long length. I think I will make another soon in the shorter length. I just recently bought this pattern and I have cut the pieces out. I am a beginner and I haven’t chosen my fabric yet. It looks like yours is cotton. It looks really cute on you. I am 5’2″ and think I will make the shirt length. I have been seeing this shirt all over and am trying to convince myself to get it! I just have so many projects purchased and not done that I think I should wait…..ya right! Yours looks great! And I am glad to know that it was easy to sew. Thanks and you’re welcome. I know what you mean about having too many unfinished projects. I’m such an impulse pattern buyer most times. I’m glad I bought this one though.